Do check out these demos to hear Deep Vibes for yourself in a variety of settings. 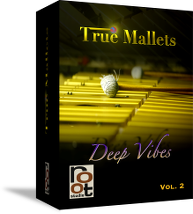 From solo to jazz ensemble to scoring type tracks, Deep Vibes is every bit as flexible as you want it to be. Special thanks fo Nils Rohwer for providing most of these great demos! Back to the standard page.